Real food has become quite the trendy phrase in the last couple of years. I love that we, as a society, are once again talking about what we eat, how it’s grown/raised, and how to cook food. Real food really does bring people together. Hey, just look at you and me, once strangers and now internet friends thanks to crispy rice bars and chicken salad. Who wouldn’t think of real food as being expensive and elitist with ingredients like these being used in so many recipes? What happened to simple vegetables from farmer’s markets, gardens, or grocery stores? At the heart of the real food movement is the idea of getting back to a simpler time of eating. Essentially, real food is about getting back to the days of great-great grandma (and keeping the food processor, crock-pot, and washing machine). While some great-great grandmothers used exotic seeds from the depths of South America (because they probably lived in the depths of South America), my great-great grandmother did not. Her cooking was probably simple and nutrient-rich, local or sourced from local vendors and stores, seasoned with simple ingredients (like butter, oil, and salt), and the recipes were hand-me-downs from her mother and grandmother. Her food wasn’t trendy, just simple food that was made lovingly with basic ingredients, yet her meals were rich in nutrients. When I think about great-great grandma’s (real) food, this is where my mind and stomach drift. I picture her food being far from elitist. I don’t believe there’s anything wrong with chia seeds, kale, or hemp hearts. And hey, if you can stomach a wheat grass shot, more power to ya! I purchase these ingredients, particularly kale, for my meals. My point is that I believe it’s easy to get caught up in the idea that real food is somehow about trendy ingredients, and forget what eating real food is all about. Real food is about getting back to basic ingredients, like good ol’ carrots, a head of cauliflower, grass-fed ground beef (the way beef was raised before large corporation feed lots), and butter. I know, pretty heavy thoughts for this little blog and chat today. Shall we move on to a simple, great-great grandma approved (at least, I think it would be) recipe? I’m hungry! 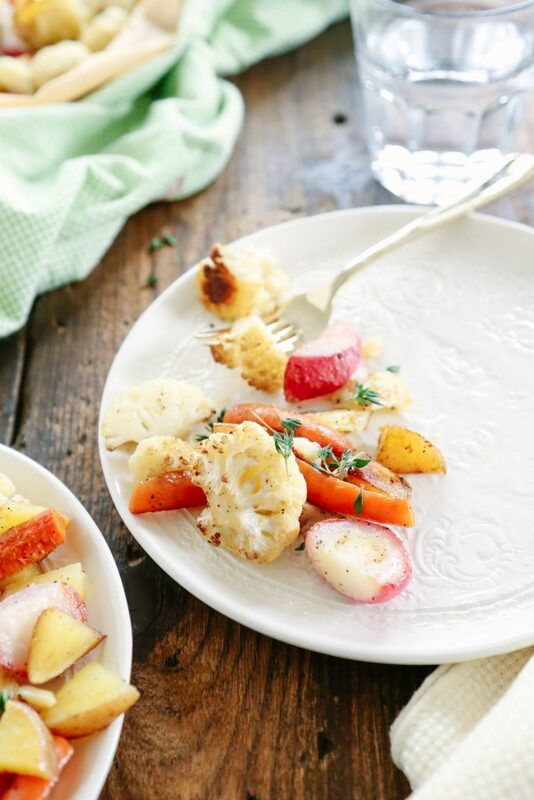 Roasted vegetables are one of the most basic and simple recipes that can be made at home, but don’t let the simplicity of this dish fool you…every bite is packed full of natural flavor! Roasted veggies are a cost-effective and versatile side dish, since the vegetables may be rotated seasonally. Plus, this dish only requires about 5-10 minutes of hands-on time. I’m confident that roasted vegetables were part of great-great grandma’s meal rotation. The appearance of the dish probably changed seasonally based on what was in her garden, and what was sold in the markets. I think if great-great grandma came to visit my kitchen today, she would be proud to help her great-great granddaughter roast a whole chicken, chop and roast veggies, and then turn the chicken bones into broth. And then she’d probably open my pantry and wonder why the crackers looked like little orange bunny rabbits. We’d definitely have a lot to talk about, and sample. 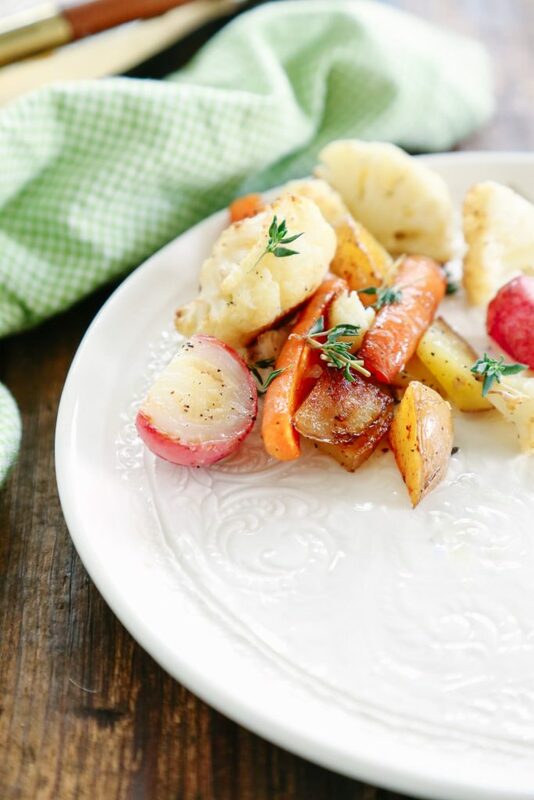 Even if you don’t love vegetables, or someone in your family holds a strong vegetable grudge, I encourage you to give roasted vegetables a try. Just once, that’s all I ask. Do it for great-great grandma! When vegetables are roasted, they turn pleasantly sweet and incredibly flavorful. Trust me, you haven’t really tasted a vegetable until you’ve tasted a roasted vegetable. 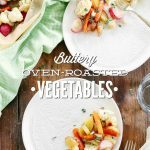 Before I share my simple “recipe,” let’s chat about a few tips for creating the perfect roasted side dish using a variety of vegetables. 1. Keep the size of the vegetables uniform. It’s important to keep the size of the vegetables uniform when you cut them. Also, try to stick with veggies that will take about the same amount of time to cook. For example: zucchini, a soft veggie, usually roasts much faster than carrots or potatoes. If you’d like to combine the zucchini and potatoes, place them on the same baking sheet, just keep them in separate areas so you can easily remove the zucchini from the pan if the potatoes need to cook longer. 2. Be generous with salt. 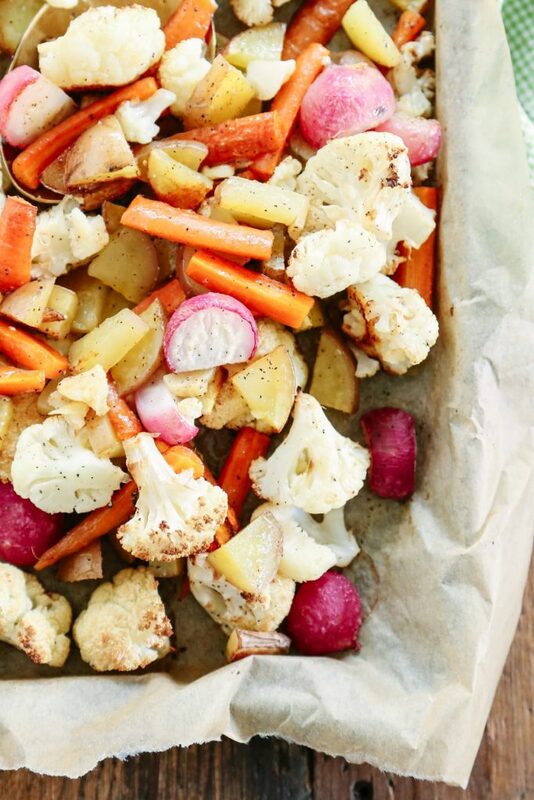 Salt is your friend when it comes to seasoning roasted veggies. It’s important to use a quality, mineral-rich salt versus a table salt. I prefer Real Salt. I recommend adding salt to the veggies before roasting them to help bring out their sweetness, and then tasting the veggies after they’re roasted and adding more salt if needed. Just keep salting and tasting until you reach your desired flavor. 3. Space out the vegetables. 4. Use a high oven temperature for roasting. A high oven temperature is key to creating flavorful, slightly crispy, and tender veggies. I prefer a temperature of 425F for roasting a medley of veggies. When vegetables are roasted, they turn pleasantly sweet and incredibly flavorful. Trust me, you haven’t really tasted a vegetable until you’ve tasted a roasted vegetable. 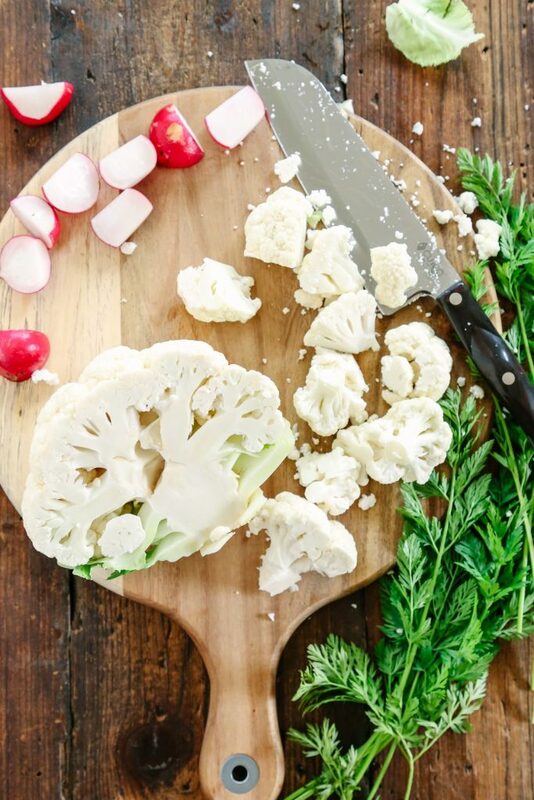 2 lbs vegetables cut into uniform pieces--Pictured: cauliflower carrots, radishes, and red potatoes. 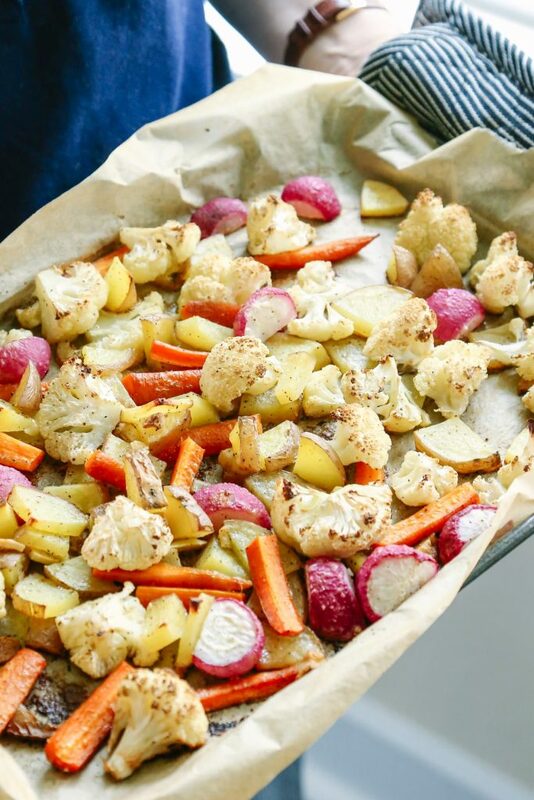 Line a rimmed baking sheet/pan with parchment paper (this keeps the veggies from sticking to the pan). 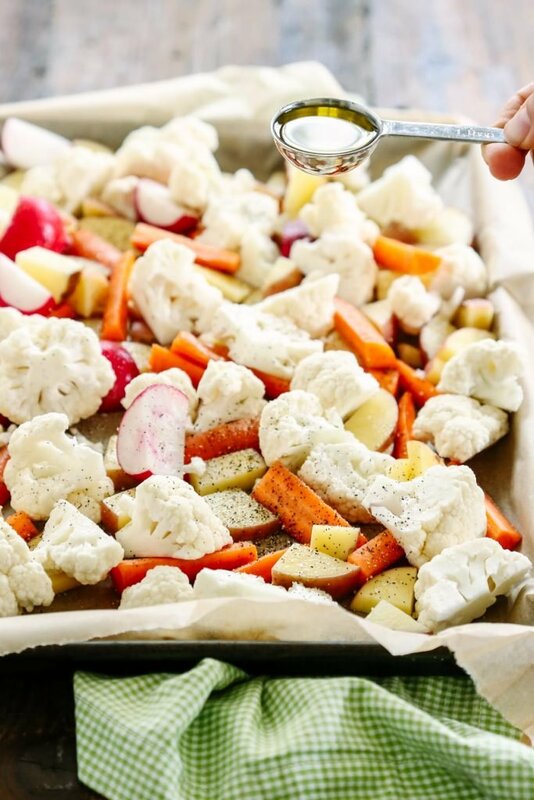 Place the veggies on the parchment paper, then sprinkle them with a few generous pinches of salt and pepper. Remember, you can add salt and pepper after they cook for additional flavor, if needed. If you're adding crushed garlic cloves (which you just want to crush with the back of a wooden spoon or large knife), add them to the veggie medley. Pour the olive oil over the veggies, and then toss the veggies to evenly coat with the oil. Spread the veggies over the parchment paper. Randomly add the butter cubes over the vegetables, and any herbs you may be using (optional). 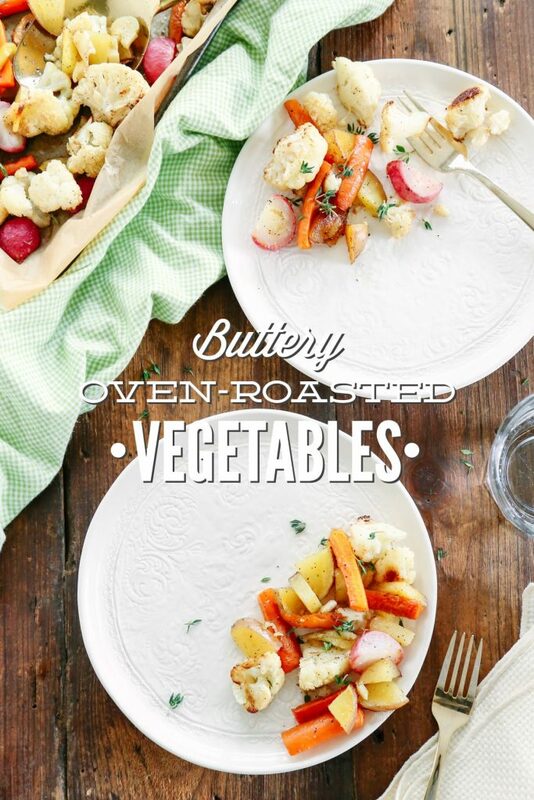 Roast the veggies in the oven for about 40-45 minutes, until they're slightly crispy and soft. If you're working with softer veggies, like zucchini or bell peppers, check on them about the 20-25 minute mark. This sounds so yummy. I will definitely be giving it a try soon! 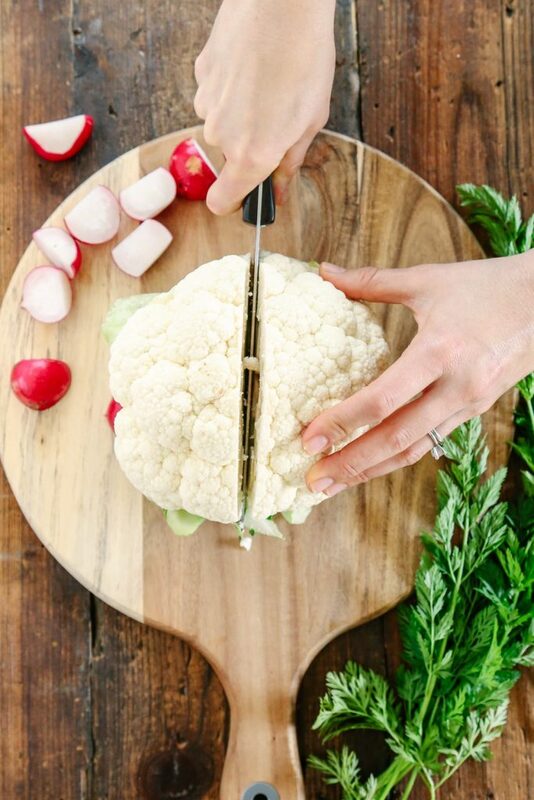 Could you use frozen cauliflower instead of fresh? And if so, would it need to be thawed beforehand? Hey Crystal, Thank you. I use frozen broccoli from time to time, so I guess you could use frozen cauliflower. Here’s more information about using frozen broccoli (and probably frozen cauliflower): http://www.budgetbytes.com/2015/12/oven-roasted-frozen-broccoli/. Kristen, What’s your advice on storing roasted veggies that I’ve meal prepped for the week? Thanks! Hey Erica, I put mine in a container with a lid and then reheat on the stove-top (in a skillet) or in the microwave. Or, for lunchboxes you can serve the veggies at room temp. I used this simple and easy recipe tonight but only used the same type of potatoes (that was what I had on hand) and the only thing that I didn’t do was use butter! I also roasted some garlic cloves like the recipe suggested and this was SO good!! This will be how I roast veggies and such from now on! 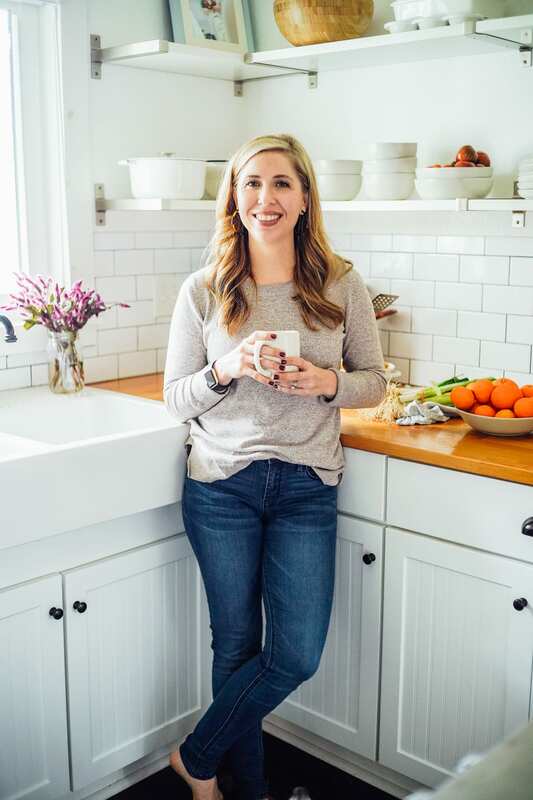 Thank you for Kristin for the inspiration to make food at home! Yay, Lori! That’s awesome. Thank you for sharing and rating the recipe.